When you step into Allstate Arena during Monster Jam weekend, the excitement hits the moment when the doors open. From the smell of high powered engines to the roar of the crowd, Monster Jam is a fun night for all those in the crowd. Monster trucks are custom-designed machines. 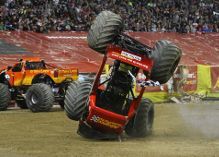 Perennial favorites like Grave Digger compete against newer trucks like Iron Man in a variety of competitions. From wheelies to races, everyone is cheering their favorite trucks and drivers to victory. A few facts about monster trucks. Each truck is approximately 12 feet tall and about 12 feet wide,and sit atop 66-inch-tall tires and weigh a minimum of 10,000 pounds. Built for short, high-powered bursts of speed, monster trucks generate 1,500 to 2,000 horsepower and are capable of speeds of up to 100 miles per hour. Monster trucks can fly up to 125 to 130 feet (a distance greater than 14 cars side by side) and up to 35 feet in the air. This year, a new item is the car crushing monster-sarus. This machine can crunch and munch a car in a matter of minutes. The kids love the power and destruction this monster machine brings. Monster Jam is showing at Allstate Arena through February 9. Save 30% on all performances using code MOM. Get Your Tickets Today- http://www.ticketmaster.com. Disclosure: My family may receive free tickets to this event for writing this post. We missed the show when they came through here. The girls were totally bummed! oh I would love to go to a Monster Truck event! That would be so much fun with the kids and the husband. I have kids who would love that! Actually forget the kids, try hubby and his friends!